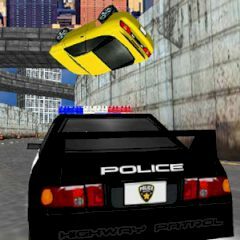 Are you able to drive the real police car? Then this is your chance! You must drive the car and try to come to the finish first! So, everything depends on you now. Use the arrow keys to move and space to use the nitro! Are you ready for that? Then do not waste your time and control the police car. Watch out! There are criminals on the loose! So, you must get in your police car and don't let them escape! Just race through the city roads, catch criminal cars and take them down! Build up nitro and smash your targets for a more effective attack! So, be ready to become a police officer and driving a patrol car. Your task is to catch and neutralize dangerous criminals, it can be done if speeding to them. Since your car is created for the chase, it has accelerator, which itself is restored. Try to visit all blocks and chips, they will slow you down and habe fun!